Immigration is in a precarious place in the United States. While media tend to focus on asylum and family separation, the Trump administration has taken aim at the H-1B Visa program. As Clear Admit previously outlined, the H-1B is necessary for any foreign-born individuals who want to work in the United States. Part of the Trump administration’s “America First” policy, the increased attention given to this visa program has created multiple issues for international students and the businesses that hire them. The first issue that most international MBAs who want to work in the United States will face is the lack of companies who are interested in hiring them. According to the 2018 GMAC Corporate Recruiters Survey, only 47 percent—down from 55 percent in 2017—of all companies surveyed in the United States intended to hiring international candidates. Students interested in working in finance, health care, manufacturing, and nonprofit sectors may want to change their plans as these are the sectors least likely to hire internationals. 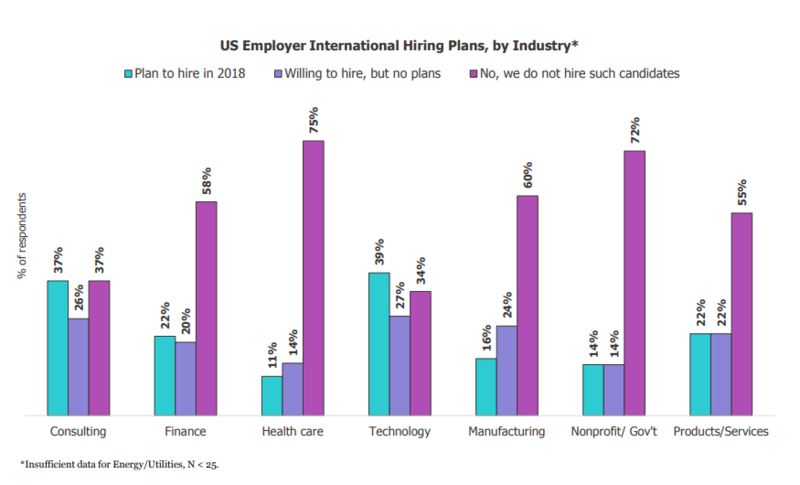 Only 11 percent of health care firms surveyed said they plan to hire international candidates in 2018, while 14 percent were willing, but had no plans. Seventy-five percent—the highest among the reporting industries—said they would not hire international personnel. Seventy-two percent of non-profit/government agencies and 60 percent of manufacturing companies also responded that they would not be hiring international candidates. The best sectors for international graduates are consulting and technology. Thirty-seven and 39 percent, relatively, reported that they plan to hire international candidates. Over a quarter of companies in both industries reported that they would be willing to hire internationally, but did not have concrete plans to do so. The number of international job-seekers in the United States has declined over the last two years from its peak of 236,000 in 2016. However, the number of applicants for H-1B visas remains high—190,000 people applied for 85,000 H1-B visas in 2018, filling the slots in five days, according to a U.S. Citizenship and Immigrant Services (USCIS) survey. In addition to the small number of slots, applicants have to deal with the fact that USCIS has increased discretion over how visas are distributed. Although they are generally three years in length, H-1B visas under Trump’s USCIS have been of increasingly bizarre lengths. As noted in the lawsuit, ITServe Alliance v. USCIS, USCIS has issued visas that last one day and 12 days. One specific visa was expired for three weeks before it was received by the recipient. This has led to increased uncertainty around international MBA students getting the cover that they need to work in the United States.